Join us for the The Link Open House! The Link is a coworking, training, and event space catalyzing workforce development and employment opportunities in Kendall Square and beyond. Its mission is to provide a space of opportunity for residents and employers to learn and connect. The Link is located at 255 Main Street - in the heart of Kendall Square. Office and co-working space is now available for nonprofits providing workforce training programs. Meeting and event space is also available for nonprofits, businesses, or other groups. The CRA is reigniting its involvement in workforce development issues in Cambridge. Historically, the CRA operated various workforce initiatives including the youth training program in Wellington-Harrington that evolved into Just-A-Start. Today the CRA is undertaking projects to strengthen connections between the vibrant technology / biotechnology industries in Kendall and the neighborhoods of Cambridge immediately around Kendall Square. This new workforce development focus began with the planning for the Foundry building, and now includes The Link, described below. Additionally, the CRA and the City have begun a collaborative research project to take a deeper dive into the workforce development needs of Cambridge. The CRA also maintains an active partnership with the Kendall Square Association to connect with and help expand the diversity and inclusion initiatives underway at our local innovation companies. 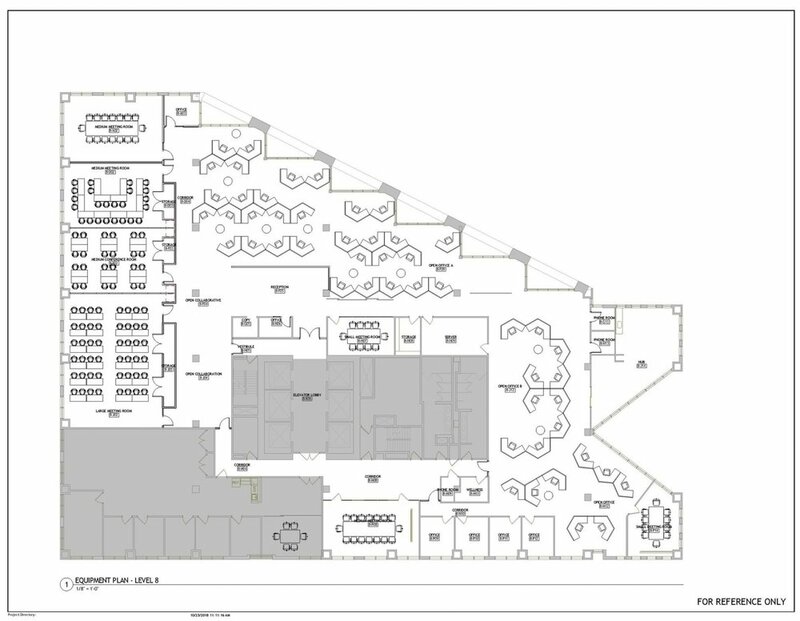 Opportunity Space Floor Plan for The Link, 255 Main Street, 8th Floor; showing classrooms and meeting rooms that may also function as event spaces, small offices, and “neighborhoods” of cubicles. The CRA has created a workforce development “Opportunity Space”, called The Link as a component of the KSURP and IDCP, to strengthen the connections between job seekers in Cambridge, Boston-area residents and the innovation economy of Kendall Square. These plans requires Boston Properties, as master developer of Kendall Square, to provide this public benefit (as well as others) in return for adding new office space to Kendall Square. The CRA and BXP have partnered with the NonProfit Center (NPC) to create The Link in existing commercial space within the 255 Main Street building. The Link started operations in March, 2019. The Link is a cluster of classrooms, small offices, gathering space, and co-working space operating within the broader Innovation Space of 255 Main Street. Programs in The Link provide a range of targeted technical education and career development opportunities. The CRA envisions that The Link will become a nexus for innovation-focused workforce development activity and employer recruitment in Cambridge. As Kendall Square is home to a wide range of local start-ups and large-scale international companies that are collectively leaders in the innovation economy, The Link will be pivotal in meeting the economic opportunity objectives of the KSURP. Mission: The Link is a workforce and career advancement center to serve as a nexus between the innovation economy of Kendall Square and Greater Boston, and underrepresented job seekers. The space fills gaps in workforce development needs, provides incubator and swing space for mission-aligned organizations seeking to locate in Kendall Square, and serves as a talent pipeline for employers. Create a center with multiple layers of career assistance services, such as assessment, education, counseling, and mentorship resources, to individuals seeking to enter the innovation economy. Deliver a high impact set of training programs targeting a range of skill levels matched to the needs of Kendall Square employers. Develop an approachable, professional space for job seekers in the community and an accessible, useful resource for employers building their workforce. The Opportunity Space will be considered successful if it becomes an essential location in the workforce development landscape of the region, and functions as a critical resource for employers seeking to fill their talent pipeline. Office space, co-working desks, meeting rooms, and event space is available for your organization! To learn more, contact The Link’s operator, the NonProfit Center, via: info@link-kendall.org or 617-945-2562.